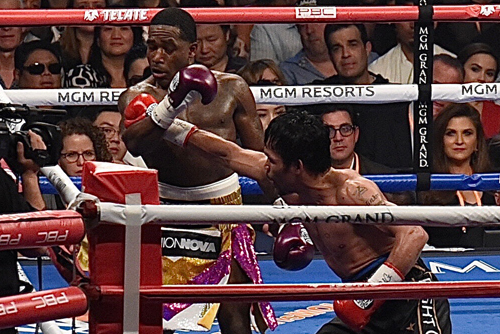 Welterweight Manny Pacquiao (61-7-2, 39 KO’s) had little or no trouble at all with safety first Adrien Broner (33-4-1, 24 KO’s) taking an easy to score unanimous decision to retain his World Boxing Association World Welterweight Title. The 40 year old fighter from The Philippines won his thefight in an impressive performance that saw him let his hands go all night long. 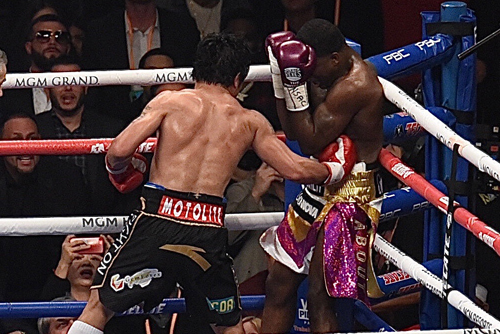 Broner’s output was anemic at best. 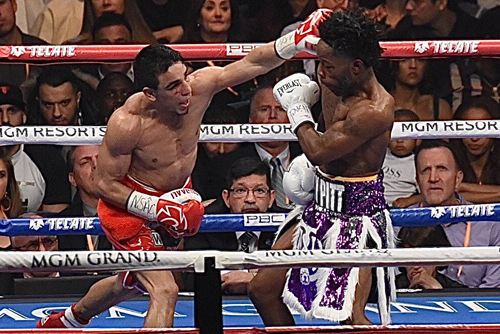 “The Problem” with Broner was he spent 99% of the night backpedaling. If he had any intentions on winning the fight he certainly didn’t show it in the ring. Manny was on his game all night. 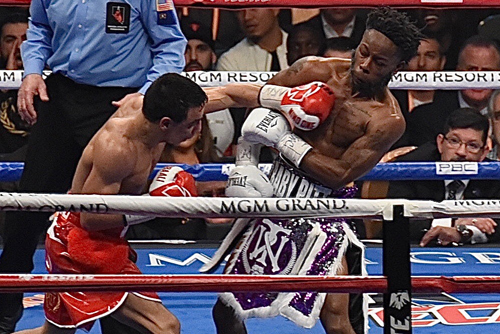 He worked a good stiff jab that was setting up power shots that stunned Broner twice in the mid-rounds. 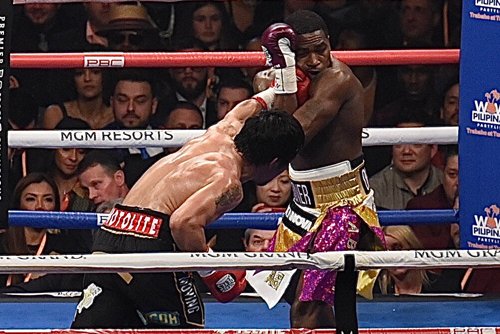 Anytime Broner was hurt he found a way to grab, clinch or wrestle his way out of trouble but the last thing on his mind was going toe to toe. He appeared to be content doing little if anything at all. 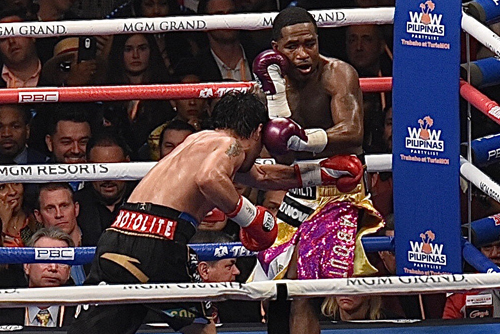 In round 11 the crowd began to boo Broner for his lack of effort. 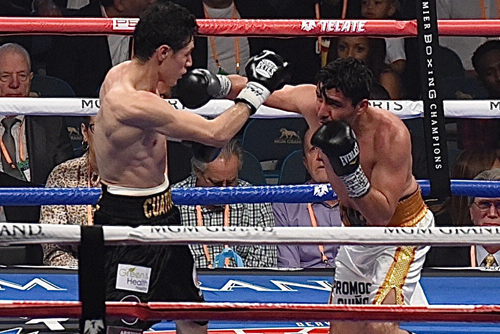 All the while Manny came forward aggressively but remained alert not to get caught with any counters or walking into something recklessly. In the end the only one of the 13,000+ in attendance that thought Broner won was “The Problem” himself. 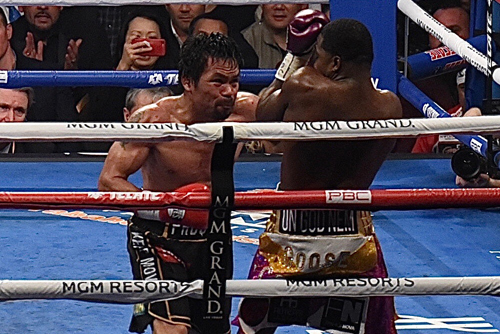 After that I am sure every scorecard in the house had Pacquiao easily winning. But,only three of those in attendance scores counted and those were the judges who gave Manny the nod on all cards 117-111 and 116-112 twice. 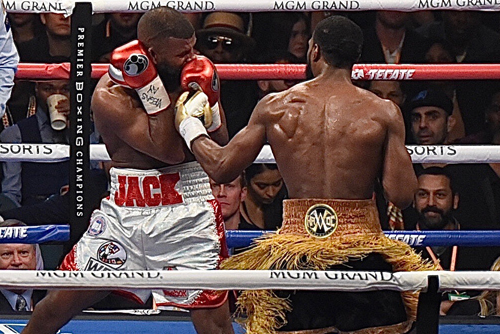 Light heavyweight Badou Jack (22-3, 13 KO’s) displayed the heart and courage of a lion but it was Marcus Browne (23-0, 16 KO’s) who left the ring in possession of the vacant World Boxing Council Silver Light Heavyweight Title. 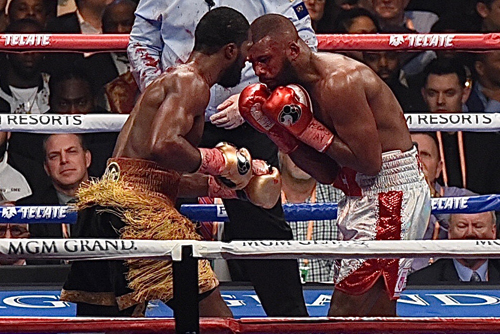 Browne began to rack up points early and often as Jack seemed tenataive. If there was any chance for Jack to get back inj the fight those hopes were dashed when a clash of heads put a wound on Jack’s forehead that looked like he got hit in the head with a meat cleaver. 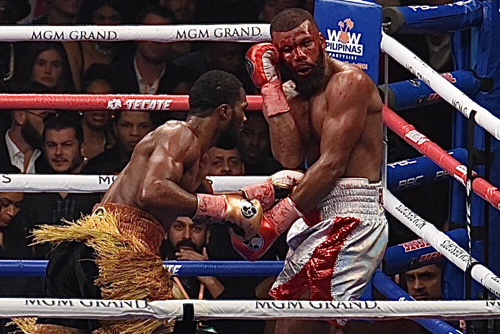 From that point on Jack was looking through a crimson veil and blood and Browne peppered the injured fighter for the remainder of the 12 round fight. Browne came out victorious with a unanimous decision. Scores in favor of the new champ Browne read 117-110, 116-111 and 119- 108. In defeat a contrite Jack quipped, "I was flat. I don't know what it was, but no excuses. Credit to Marcus Browne he boxed well. I would love the rematch. Now I have to rest, get the head fixed and hopefully get that chance in the future." Bantamweight Rau'shee Warren (16-3, 4 KO’s) and Nordine Oubaali (15-0, 11 KO’s)were no strangers to each other as they had faced each other in Olympic competition numerous times. 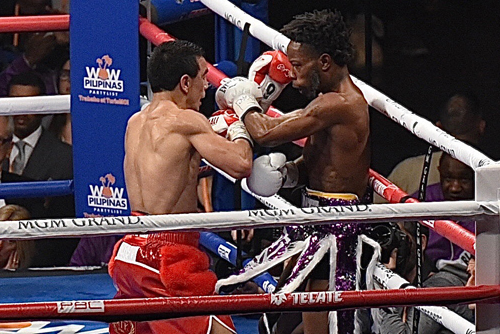 On this night Oubaali took what he learned from the past to score a unanimous decision victory over Warren. For his American debuting efforts the Frenchman too home the vacant World Boxing Council World Bantamweight Title. Final scores read 115-113, 116-112, 117-111 all in favor of Oubaali. An elated Oubaali said of his victory, “This was my dream. I made my dream come true, my American dream. I want to thank all the people of America and France who supported me. I put on the pressure. I had the speed. He is a very good boxer – he’s slick, and he’s smart. This is a very big night to win my first world championship." 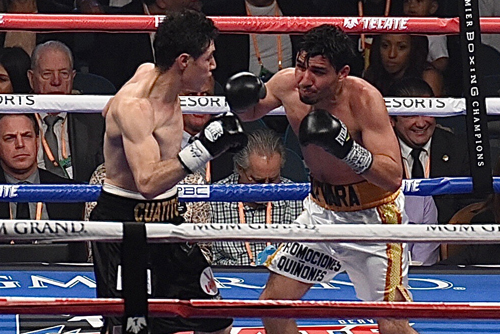 Featherweight Hugo Ruiz (39-4, 33 KO’s) had no trouble disposing of Alberto Guevara (27-4, 12 KO’s) in a somewhat lack luster one sided bought. Final scores read 100-89 and 99-90 twice. "I trained for the southpaw and then I had to fight a right hander at the last minute. The other guy was a puncher and this guy is a boxer. It made it difficult for me to fight him because it wasn't what I trained for. It was very difficult when there is one fighter that you are prepared to fight in the ring and it doesn't turn out that way. It was supposed to be a title fight. I was so disappointed and my mind wasn't totally in it."